Essays on prophets of the Latter-day Saints (Mormons) and their followers. We cannot truly love God if we do not love our fellow travelers on this mortal journey. Likewise, we cannot fully love our fellowmen if we do not love God, the Father of us all. The Apostle John tells us, “This commandment have we from him, That he who loveth God love his brother also.” We are all spirit children of our Heavenly Father and, as such, are brothers and sisters. As we keep this truth in mind, loving all of God’s children will become easier. Actually, love is the very essence of the gospel, and Jesus Christ is our Exemplar. These words, spoken by President Thomas S. Monson this spring are reflective of the theme of this lesson built from quotes from another president of the Church. In chapter 20 of Teachings of the Presidents of the Church: Joseph Fielding Smith, President Smith teaches us to love and serve all of God’s children. In the “From the life of Joseph Fielding Smith” section, three examples of loving service are given by Joseph himself. Section 1 focuses on the idea that we are all children of God, and should love each other because we’re spiritual siblings. Section 2 focuses on working together and caring for each other, with a special focus on Church contexts. Section 3 encourages us to serve and help each other. Section 4 has a charming story about a horse President Smith took care of as a child with the message that we ought not to judge, but take the good in everyone and make room for a few faults. Section 5 focuses on the doctrinal necessity to love God and our fellow humans. Perhaps the most obvious choice for a supplementary talk to this lesson is the general conference address by President Thomas S. Monson cited above, and available in full here. Beyond that, however, there are a plethora of quotes and comments available on the subject of love, service, and charity. Another great talk from a few years ago on friendship and love is Marlin K. Jensen, “Friendship: A Gospel Principle,” General Conference, April 1999. Another useful resource related to the story of President Smith’s horse is a clip taken from a short documentary that relates the story of going out with his mother in the middle of the night. It could be used to introduce the section and break up the lesson just a little, and is available here. I have wondered why there is so much hatred in the world. We are involved in terrible wars with lives lost and many crippling wounds. Coming closer to home, there is so much of jealousy, pride, arrogance, and carping criticism; fathers who rise in anger over small, inconsequential things and make wives weep and children fear. Racial strife still lifts its ugly head. I am advised that even right here among us there is some of this. I cannot understand how it can be…. Throughout my service as a member of the First Presidency, I have recognized and spoken a number of times on the diversity we see in our society. It is all about us, and we must make an effort to accommodate that diversity. Let us all recognize that each of us is a son or daughter of our Father in Heaven, who loves all of His children…. When the Son of man shall come in his glory, and all the holy angels with him, then shall he sit upon the throne of his glory: And before him shall be gathered all nations: and he shall separate them one from another, as a shepherd divideth his sheep from the goats: And he shall set the sheep on his right hand, but the goats on the left. Then shall the King say unto them on his right hand, Come, ye blessed of my Father, inherit the kingdom prepared for you from the foundation of the world: For I was an hungred, and ye gave me meat: I was thirsty, and ye gave me drink: I was a stranger, and ye took me in: Naked, and ye clothed me: I was sick, and ye visited me: I was in prison, and ye came unto me. Then shall the righteous answer him, saying, Lord, when saw we thee an hungred, and fed thee? or thirsty, and gave thee drink? When saw we thee a stranger, and took thee in? or naked, and clothed thee? Or when saw we thee sick, or in prison, and came unto thee? And the King shall answer and say unto them, Verily I say unto you, Inasmuch as ye have done it unto one of the least of these my brethren, ye have done it unto me. Then shall he say also unto them on the left hand, Depart from me, ye cursed, into everlasting fire, prepared for the devil and his angels: For I was an hungred, and ye gave me no meat: I was thirsty, and ye gave me no drink: I was a stranger, and ye took me not in: naked, and ye clothed me not: sick, and in prison, and ye visited me not. God places a premium upon the human soul, revealing to Joseph Smith that “the worth of souls is great in the sight of God; for, behold, the Lord your Redeemer suffered death in the flesh; wherefore he suffered the pain of all men, that all men might repent and come unto him. 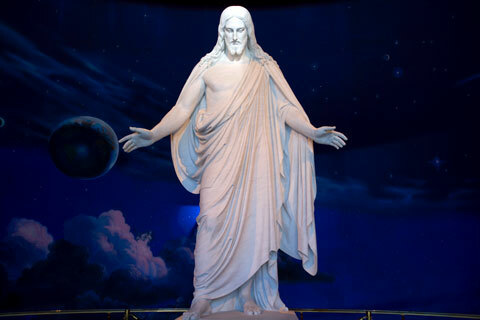 And he hath risen again from the dead, that he might bring all men unto him, on conditions of repentance.” (D&C 18:10-11). Elsewhere, it was revealed by God that, “This is my work and my glory—to bring to pass the immortality and eternal life of man.” (Moses 1:39.) This being God’s purpose, He is pleased when we work together to help rather than hinder each other in the process of gaining eternal life. That is why James wrote that: “Pure religion and undefiled before God and the Father is this, To visit the fatherless and widows in their affliction and to keep himself unspotted from the world.” (James 1:27.) At its heart, religion is for shaping us into beings that partake of the divine nature and giving us opportunities to develop right relationships with God and with our fellow humans. The Prophet Joseph Smith, in addressing social righteousness, once stated that, “Righteousness is not that which men esteem holiness. That which the world call righteousness I have not any regard for. To be righteous is to be just and merciful. If a man fails in kindness justice and mercy he will be damed.” Once more, righteousness is equated with how we treat each other. I’ve discussed this idea in my other blog, but in all the recorded sermons and writings of Joseph Smith, Jr. available to us today, only three principles were ever given the lofty title of being a “grand, fundamental principle of Mormonism” or even simply the “fundamental principles.” If taken as the pillars of Mormonism, these principles could be considered the definitive essence of Mormonism, comparable to the “Five Pillars” of Islam or the “Four Noble Truths” and “Eightfold Path” of Buddhism. Yet, while most Mormons would be familiar with, for example, the 12 Articles of Faith or the threefold purpose of the Church, they probably could not list the grand fundamental principles of Mormonism enumerated by Joseph Smith in the latter end of his life. Joseph Smith, Jr. laid down a few fundamental principles of Mormonism in his final years. What, then, are these pillars of Mormonism? In 1838, Joseph wrote that, “The fundamental principles of our religion are the testimony of the Apostles and Prophets, concerning Jesus Christ, that He died, was buried, and rose again the third day, and ascended into heaven; and all other things which pertain to our religion are only appendages to it.” Then, in the summer of 1843, Joseph declared that, “the grand fundamental principles of Mormonism is to recieve thruth let it come from where it may,” and that “friendship is the grand fundamental principle of Mormonism.” While each of these three principles deserves a good look, the principle of friendship is the most pertinent to this chapter in the Joseph Fielding Smith manual. Together, this dynamic duo of societies demonstrated the ideal that Joseph tried to have the Saints in his day live as they sought to build their own Zion on earth—a people, united in love and friendship. Among the commands given in the voice of the Lord to prepare the Saints to go to the land that Joseph designated as Zion are imperatives such as, “let every man esteem his brother as himself, and practice virtue and holiness before me…. 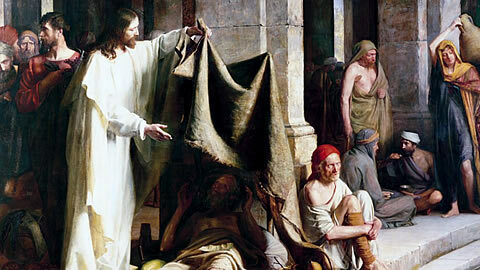 I say unto you, be one; and if ye are not one ye are not mine.” (D&C 38:24, 27.) 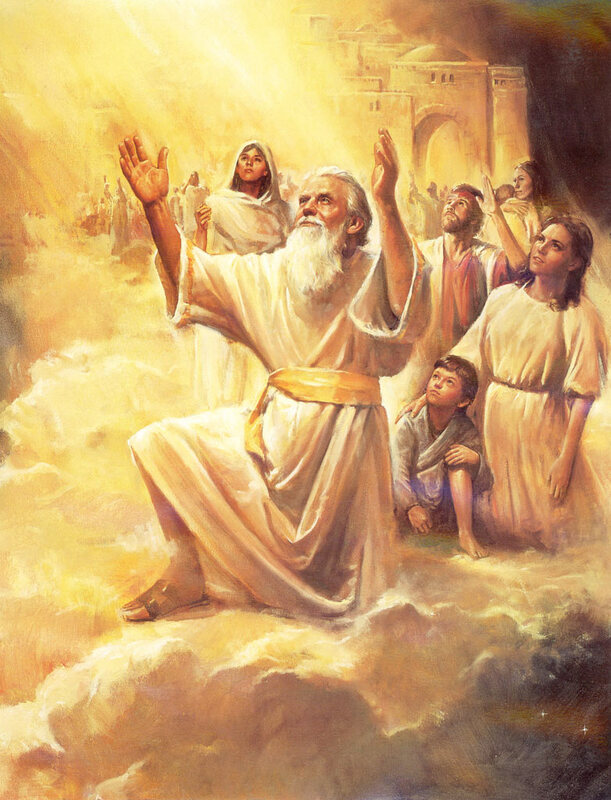 When Zion failed and the Saints were driven out of the land, it was declared to be at least partly because, “there were jarrings, and contentions, and envyings, and strifes, and lustful and covetous desires among them; therefore by these things they polluted their inheritances.” (D&C 101:6.) Although the Saints had lost their chance to build the city called Zion for the time being, they still strove to build stakes or outposts of Zion wherever they ended up—a process that, though spiritualized in many way, still continues today. In addition to the idea of building a physical kingdom of believers united in bonds of love, friendship manifests itself in other core aspects of Mormonism. Salvation, in Joseph Smith’s view, was obtained through covenants and related ordinances, and these covenants of salvation were not only to be made between humans and God, but also between human beings. 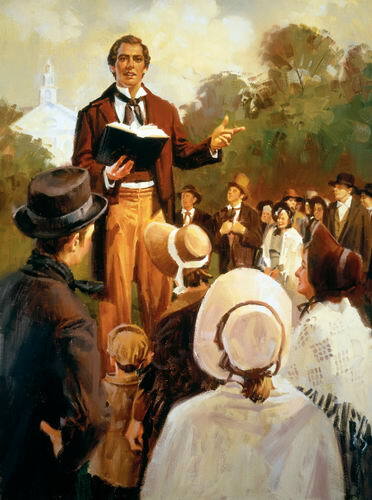 Most explicit of all covenants of friendship revealed by Joseph Smith, perhaps, was the covenant members of the School of the Prophets made, in which participants greeted each other and declared that, “I receive you to fellowship, in a determination that is fixed, immovable, and unchangeable, to be your friend and brother through the grace of God in the bonds of love, to walk in all commandments of God blameless, in thanksgiving, forever and ever.” (D&C 88:133.) Baptism, for another example, not only involved taking the name of Christ upon an individual but also the covenant to “bear one another’s burdens… mourn with those that mourn; yea, and comfort hose that stand in need of comfort.” (Mosiah 18:8-9.) In addition, the crowning ordinance to be performed for most Mormons in mortality was and is the marriage ordinance performed in the temple, which not only involves covenants with God, but binds a man and wife as well any children they have or may have together eternally by priesthood authority as well as with covenants to each other. Fellowship among the Saints was also prerequisite to gain power and reconciliation with God. Joseph told the Relief Society that, “it grieves me that there is no fuller fellowship—if one member suffer all feel it[.] by union of feeling we obtain pow’r with God” and that, “If you would have God have mercy on you, have mercy on one another.” Likewise, in the version of the Sermon on the Mount preached by the risen Christ in the Book of Mormon, the Christ states that, “Therefore, if ye shall come unto me, or shall desire to come unto me, and rememberest that thy brother hath aught against thee—go thy way unto thy brother, and first be reconciled to thy brother, and then come unto me with full purpose of heart, and I will receive you.” (3 Nephi 12:23-24.) To reconcile with Christ, the Saints must reconcile with each other. The Mussulman condemns the heathen, the Jew, and the Christian, and the whole world of mankind that reject his Koran, as infidels, and consigns the whole of them to perdition. The Jew believes that the whole world that rejects his faith and are not circumcised, are Gentile dogs, and will be damned. The heathen is equally as tenacious about his principles, and the Christian consigns all to perdition who cannot bow to his creed, and submit to his ipse dixit [dogma]. “Wherein do you differ from other in your religious views?” In reality & essence we do not differ so far in our religious views but that we could all drink into one principle of love One the grand fundamental principles of Mormonism is to recieve thruth let it come from where it may.—we belive in the great Eloheim. who sits enthroned in yonder heavens.—so do the presbyterians. If as a skillful mechanic In taking a welding heat I use a borax & allum &c. an succeed in welding you all together shall I not have attained a good object. if I esteem mankind to be in error shall I bear them down? No! I will will lift them up. & in his own way if I cannot persuade him my way is better! & I will ask no man to believe as I do. Do you believe in Jesus Chrst &c? So do I. Christians should cultivate the friendship with others & will do it. 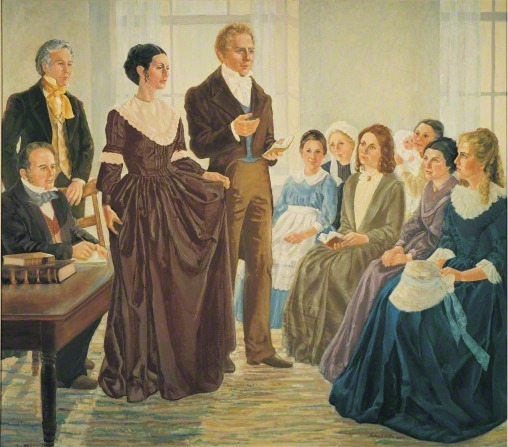 Invoking this passage, Joseph Smith conveyed the radical idea that the Latter-day Saints and those of other traditions jointly comprise the body of Christ…. Joseph envisioned a Christendom united by faith in God and Jesus Christ and by mutual love, a contemplated unity which might best be understood on the model offered by Freemasonry. Freemasons have long sought cross-denominational unity, without ecclesiastical integration, based on belief in God, brotherhood, and a commitment to truth and to relieving the needs of the poor. While advocating Christian unity, however, Joseph clearly did not envision the institutional unification of Christendom, the merging of all church structures into one. 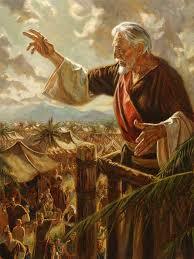 He continued to maintain Mormonism’s exclusive claims to authority to perform ordinances or sacraments. Sandwiched between his ecumenical 9 July and 23 July sermons, for instance, Joseph dictated and taught a revelatory text declaring that the sacrament of marriage was eternally binding only if performed by the priesthood of Elijah and that Joseph himself was the one man on earth holding the keys of this priesthood. Friendship is the grand fundamental principle of Mormonism, [it is designed] to revolution[ize and] civilize the world.—pour forth love. Friendship [is] like Bro Turley [in his] Blacksmith Shop [welding iron to iron; it unites the human family with its happy influence]…. [If the] Presbyterians [have] any truth. embrace that. [Same for the] Baptist. Methodist &c. get all the good in the world. [and you will] come out a pure Mormon. Friendship is on the of grand fundamental principles of Mormonism and ought to be a defining force in all interactions that Mormons have with those inside their families and faith communities as well as with those of other faiths. If applied more fully, as Joseph Smith taught it should be, it would not only revolutionize and civilize the world, but would turn Mormonism into a veritable heaven on earth. Thomas S. Monson, “Love—the Essence of the Gospel,” CR, April 2014. Susan Christiansen, et. 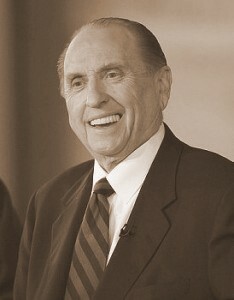 al (editors), Words of Wisdom: A Collection of Quotes for LDS Women, (Lulu, 5. 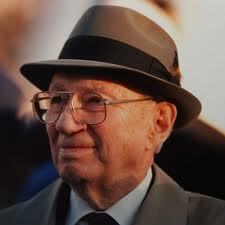 Gordon B. Hinckley, Teachings of Gordon B. Hinckley (Salt Lake City: Deseret Book Company, 1997), 589. Boice, Trina (2013-11-13). The Ready Resource for Relief Society Teaching: Joseph Fielding Smith (Kindle Locations 2330-2333). Cedar Fort, Inc.. Kindle Edition. B.H. Roberts, CR, April 1914, 101. 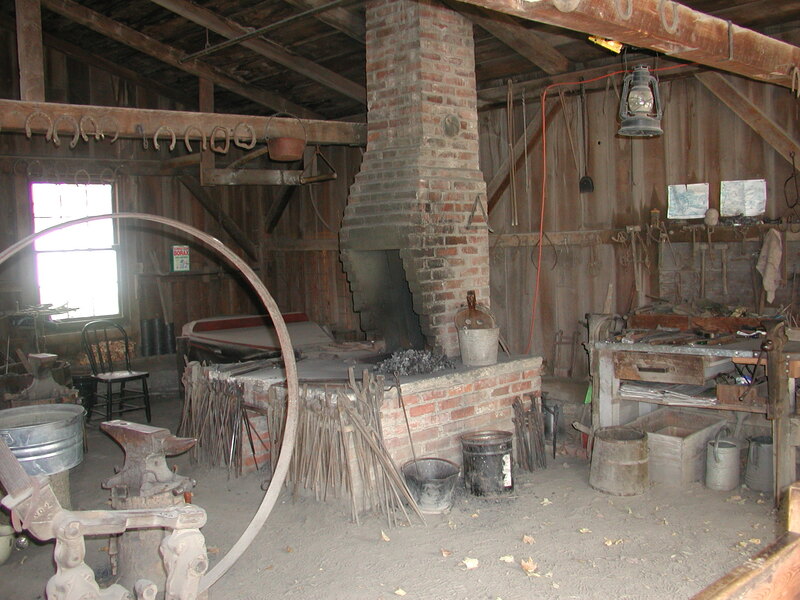 Cook, Lyndon W. (2009-09-03). The Words of Joseph Smith (Kindle Locations 4052-4053). Deseret Book Company. Kindle Edition. The full essay that this comes from is available here. Joseph Smith, Jr., Teachings of the Presidents of the Church: Joseph Smith (Salt Lake City: Church of Jesus Christ of Latter-day Saints, 2007), 49. Joseph Smith, Jr., Teachings of the Presidents of the Church: Joseph Smith (Salt Lake City: Church of Jesus Christ of Latter-day Saints), 461. For further reading on the idea of Zion in Mormonism, I have a four-part series of blog posts starting here. Cook, Lyndon W. (2009-09-03). The Words of Joseph Smith (Kindle Locations 4714-4719). Deseret Book Company. Kindle Edition. The brackets are added from clarity, and the longer sections added are taken from the History of the Church rendition of the sermon. This entry was posted in Joseph Fielding Smith, Joseph Smith, Teachings of the Presidents of the Church and tagged #EldersQuorum, #LDS, #ReliefSociety. Bookmark the permalink.